DIGITIZATION: The Monk Who Saves Manuscripts From ISIS. Why a Christian wants to rescue Islamic artifacts (Matteo Fagotto, The Atlantic). ... I followed him through the narrow alleys of the souq. Stopping in front of an iron door surmounted by a stone arch, he entered the gate of St. Mark’s Syrian Orthodox Monastery [in Jerusalem]. A group of monks sitting around a white plastic table greeted him warmly. After some small talk and a few sips of cardamom coffee, a frail, bearded man led him upstairs into a dusty room. Waiting in wooden cabinets were rows of priceless manuscripts dating back to the sixth century. Some past PaleoJudaica posts on the Hill Museum & Manuscript Library (HMML) are collected here (cf. here). Father Stewart's work is noted there and has come up on PaleoJudaica previously here, here, here, and here. For many other manuscript digitization projects, start here and follow the links. Cf. also here. A NEW ISSUE Hugoye: Journal of Syriac Studies 20.1 (2017). I'm always happy to see more from this excellent, open access journal. Follow the link for the TOC. I note that in the current issue there is an article on The Cave of Treasures. Cross-file under Syriac Watch and Old Testament Pseudepigrapha Watch. Margreet L. Steiner, Ann E. Killebrew (ed. ), The Oxford Handbook of the Archaeology of the Levant c. 8000-332 BCE. Oxford handbooks in archaeology. Oxford; New York: Oxford University Press, 2014. Pp. xxi, 885. ISBN 9780199212972. $175.00. So, cui bono? It is unfortunate to conclude that this is not really a handbook in any meaningful sense, that the uneven and at times neglectful treatment of material culture in some sections is disappointing, and that the volume is more of a vast and at times somewhat unprincipled compendium (though of often very good scholarship). This is regrettable because, apart from the qualities of the individual contributions in the diachronic or thematic sections, such as Gzella on peoples and languages (chapter 2) and Sharon on the complexities of chronology (chapter 4), some of the period clusters fit at least together quite nicely, even if the authors do not explicitly cross-reference their neighbours. Likewise, the commentators on the individual sections generally do an excellent job in making overall sense of the theme. Perhaps had the publishers invested more in the basic presentation of the book and given the authors—and perhaps editors—far more scope for better visualizing the masses of data cited, they would have provided a better investment for the punter. Greek texts written by Jews in the Hellenistic and Imperial period (ca. 3rd century B.C.E. to 3rd C.E.) occupy numerous positions within two traditions; Jewish liturgical, religious and legal texts combine with historians, poets, novelists and tragedians. Some are translations, others new compositions. Some are written for a Jewish, others for a non-Jewish audience. Much has been said about the historical as well as theological contexts and content of these works. However, relatively few studies have considered these Jewish writings in Greek as literary works. The conference takes place on 6-8 September 2017. Follow the link for further particulars and information on submitting a paper proposal. THE MITZPEH: Meyerhoff Center hosts lecture on dragon slaying in Ancient Hebrew texts (Nicole Reisinger). Dragons, storm gods, and the sea were the focal points of Robert Miller’s lecture Wednesday when he addressed a group of about 30 students and faculty. The lecture, “Dragonslaying in the Ancient Near East, Hebrew Bible and Early Jewish Texts,” was the first of four spring semester talks organized by the Meyerhoff Center for Jewish Studies [at the University of Maryland]. Junior linguistics and Jewish studies major Rebecca Magazine said she had never attended one of these lectures before. Miller, a Ph.D. in Ancient Near Eastern Studies from the University of Michigan, is an associate professor of Old Testament at the Catholic University of America. He’s also an affiliate of the Meyerhoff Center, spoke on the complex origins of the dragon slaying mytheme. Sounds like it was a good lecture. H-JUDAIC: CONF: A conference in honor of Prof. Shamma Friedman On the occasion of his 80th birthday, Wednesday, 15 March, 2017. It takes place at the Schechter Institute for Jewish Studies, 4 Avraham Granot St., Jerusalem. There are many interesting-looking papers on Talmudic Judaism and related matters. The Copenhagen Qumran Initiative and the Theological Faculty of the University of Copenhagen are organizing an international symposium focusing on the Aramaic texts from the Qumran Caves. The texts from the Qumran Caves written in Aramaic make up a variegated corpus with several literary genres represented. These texts are interesting not only because of their literary contents and their historical significance, but also because they throw new light on the history of the Aramaic language, and the linguistic situation in Palestine in the late Second Temple period. Some of the texts are related to biblical literature in Hebrew in ways that are not always easily grasped. Arguably, some of the Aramaic texts may represent earlier versions of the cognate Hebrew compositions. While focusing attention on vision texts and the “testament” genre, the symposium will attempt to cover a wide range of topics related to this fascinating material. We welcome papers on topics related to Aramaic Qumran texts. If you are interested in participating, and in presenting a paper, please contact Kasper Siegismund, ksi@teol.ku.dk. THE EERDWORD BLOG: The Nephilim and the Fallen Angels, by Loren Stuckenbruck. The mythical story of fallen angels preserved in 1 Enoch and related literature was profoundly influential during the Second Temple period. In The Myth of Rebellious Angels renowned scholar Loren Stuckenbruck explores aspects of that influence and demonstrates how the myth was reused and adapted to address new religious and cultural contexts. Good stuff, although somehow Eerdword has managed to reverse all the Hebrew script in the excerpt, which is distracting. They apologize at the bottom of the post and attribute it to "coding constraints." That's not good enough. Get better codes and fix it! The book was published by Mohr Siebeck in 2014. The paperback version has now been published by Eerdmans in 2017. READING ACTS: God as the Judge in Apocalyptic Literature. A feature of apocalyptic which is drawn from the Hebrew Bible is the belief God will intervene in history to destroy the evil attacking the faithful. The nation of Israel always understood God as their defender. There is a great deal of “warrior language” in the Old Testament, it is God that fights on behalf of the nation. In addition to this, Israel always understood God to be their king. I would nuance this point a little though. Both 4 Ezra (an "apocalypse") and the Qumran sectarians (with an "apocalyptic" worldview) narrowed the true, faithful, Israel to a limited group within historical Israel. Daniel, the Similitudes, and, e.g., 2 Baruch seem to take a broader view. MARKERS OF AUTHENTICITY BLOG: CfP: Panel on Forgeries at SBL Annual Meeting (Malcolm Choat). "The call for papers closes on 8th March 2017." Sounds like a promising topic. Are two elephants a fair trade for the Siloam Inscription? EPIGRAPHY DEAL? Minister offers Turkish mayor elephants for ancient Hebrew inscription. 2,700-year-old Siloam inscription, taken by the Ottomans and still held in Istanbul, marks direct evidence of Bible’s account of King Hezekiah’s tunnel-building in Jerusalem (Ilan Ben Zion et al., Times of Israel). Culture Minister Miri Regev used an impromptu trip to southern Turkey for a basketball game to offer a different kind of trade: Two elephants for an ancient inscription from Jerusalem currently housed in a Jewish museum, considered one of the most important ancient Hebrew inscriptions in existence. Regev was heard making the offer in a video posted online of an informal chat with Gaziantep mayor Fatma Sahin Wednesday. Regev was in Turkey to accompany the Ironi Nahariya basketball team for a Europe Cup game, after Turkish authorities insisted that a minister be present in order for the team to bring their own armed guards. In the video, Sahin, a politician from the ruling AKP party, speaks of her zoo’s elephant problem: it has just one, and it wants more. “We’re willing to work for it,” the mayor quips. I guess it was worth a try. For background on the Siloam inscription and the negotiations for its return to Israel, start here and follow the links. "Magic culture is certainly fascinating. But what is it? What, in fact, are magic writings, magic artifacts?" Originally published in Hebrew in 2010, Jewish Magic Before the Rise of Kabbalah is a comprehensive study of early Jewish magic focusing on three major topics: Jewish magic inventiveness, the conflict with the culture it reflects, and the scientific study of both. The first part of the book analyzes the essence of magic in general and Jewish magic in particular. The book begins with theories addressing the relationship of magic and religion in fields like comparative study of religion, sociology of religion, history, and cultural anthropology, and considers the implications of the paradigm shift in the interdisciplinary understanding of magic for the study of Jewish magic. The second part of the book focuses on Jewish magic culture in late antiquity and in the early Islamic period. This section highlights the artifacts left behind by the magic practitioners—amulets, bowls, precious stones, and human skulls—as well as manuals that include hundreds of recipes. Jewish Magic before the Rise of Kabbalah also reports on the culture that is reflected in the magic evidence from the perspective of external non-magic contemporary Jewish sources. Issues of magic and religion, magical mysticism, and magic and social power are dealt with in length in this thorough investigation. Scholars interested in early Jewish history and comparative religions will find great value in this text. For the TOC and introduction, see here. For more on Dr. Harari's work, including a forthcoming contribution to the More Old Testament Pseudepigrapha Project, see here. Mr. Hendin will discuss the origins and production of ancient Jewish Coinage from the Persian era until the time of the revolts against Rome. Date: TBA. Venue: American Numismatic Society. READING ACTS: Defining Apocalyptic Literature. This could be expressed a little more clearly. John Collins has done important work on defining the literary genre "apocalypse," as summarized in the blog post. There is no "apocalyptic" genre. There have been various attempts to define "apocalyptic" as a worldview, but these definitions do not find the same general acceptance that the genre "apocalyse" does. After all, there are plenty of examples of apocalypses. Demonstrating the existence of a worldview is more difficult. Collins defines the apocalyptic worldview as a belief in the active influence of supernatural entities (i.e., angels and demons) on human affairs, along with a belief in eschatological salvation involving the judgment of human beings after death. A template for the First Temple? The similarities between the ’Ain Dara temple [in northern Syria] and the temple described in the Bible are indeed striking. Both buildings were erected on huge artificial platforms built on the highest point in their respective cities. The buildings likewise have similar tripartite plans: an entry porch supported by two columns, a main sanctuary hall (the hall of the ’Ain Dara temple is divided between an antechamber and a main chamber) and then, behind a partition, an elevated shrine, or Holy of Holies. They were also both flanked on three of their sides by a series of multistoried rooms and chambers that served various functions. Even the decorative schemes of ’Ain Dara temple and the temple described in the Bible are similar: Nearly every surface, both interior and exterior, of the ’Ain Dara temple was carved with lions, mythical animals (cherubim and sphinxes), and floral and geometric patterns, the same imagery that, according to 1 Kings 6:29, adorned the Temple of King Solomon in the Bible. Alas, they don't seem to have found an Ark of the Covenant there either. But, seriously, the parallels sound impressive. This BDH post was published in 2013, but I missed it then. EPIGRAPHY: Hebrew carvings on column lend weight to Galilee village’s Jewish past. IAA says discovery of 1,800-year-old limestone capital bearing inscriptions reinforces association of Druze village of Peki’in with Roman-era center of Jewish scholarship (Ilan Ben Zion, Times of Israel). pair of 1,800-year-old Hebrew inscriptions carved into a capital found last week in the Druze village of Pekiin may lend support to a tradition linking the Galilean village to an ancient center of Jewish scholarship. The inscriptions, etched into a limestone block buried beneath a courtyard of a building adjacent to the village’s 19th-century synagogue, were found during restoration work, the Israel Antiquities Authority announced Tuesday. The antiquities authority was tight-lipped about the find and refused to disclose the text of the inscriptions, saying they were still being studied and wouldn’t be published until they appear in a scholarly journal. The IAA also wouldn’t say how archaeologists who inspected the inscriptions determined they were 1,800 years old. The IAA did disclose that the inscriptions appeared to be dedications by donors to the synagogue, lending support to the tradition of a Jewish presence during the Roman period. Cargill on Qumran "Cave 12"
I must, in all fairness, concede that Gutfeld’s speculation is entirely plausible. However, we must also acknowledge that it is still speculation—even if well-informed speculation on the part of Prof. Gutfeld—because no Dead Sea Scrolls were actually discovered in the cave! We could similarly speculate that scrolls were once present in several other caves excavated in the past, but that does not make them scroll caves. If there are no Dead Sea Scrolls in the cave, then it is not a scroll cave, even if we think there might have been in the past. But that does not mean the discoveries in the cave are not important. Read it all. THE JOURNAL FOR THE STUDY OF JUDAISM VOLUME 47 (2016, issues 1-5) is now complete and available online. There are lots of articles and reviews on Judaism in the Persian, Hellenistic and Roman periods. You can read the TOC and abstracts for free, but access to the articles requires a paid personal or institutional subscription. They have also advance-posted a number of articles that are coming out in 2017. Some earlier articles/issues from vol. 47 has already been noted here, here and here. YAZIDI WATCH: Canada to welcome 1,200 Yazidi refugees from Iraq. Vulnerable religious minority targeted by Islamic State as heretics, being taken in by Ottawa at ‘controlled pace’ (AFP/Times of Israel). Past PaleoJudaica posts on the Yazidis, their Gnosticism-themed religion, and their tragic fate in the hands of ISIS, are here and here with many links. THE EERDWORD BLOG: Five Great Books on Apocrypha and Pseudepigrapha. It's a good list. I am pleased to see Old Testament Pseudepigrapha: More Noncanonical Scriptures, volume 1 (ed. Bauckham, Davila, and Panayotov) among them. Cross-file under Old Testament Pseudepigrapha Watch and New Testament Apocrypha Watch. TRANSLATION FAIL? How a translation mistake ended up making India a part of the Bible. Whether medieval Christians saw India as a symbol of evil or as the home of saints, the Subcontinent remained a source of fascination (Scroll.in). Another error in translation brought India into Jerome’s Latin Bible, where it remained at the heart of Catholic belief for over 1,500 years. Jerome, who lived in 347-420 CE, was a monk from modern Croatia who undertook a pioneering translation of the Hebrew Old Testament and Greek New Testament into Latin, the language of the Roman empire. But Jerome also found time to indulge other interests, including a fascination for India. He seems to have read nearly everything about the Subcontinent that would have been available in Greek and Latin. His letters to friends, colleagues and potential converts are full of references to features of South Asian life in that period – the caste system, Buddhism, and sati. They also mention magical gems and fabulous creatures, like the unicorn, that people in the Mediterranean region believed could be found in India. With India on his mind, Jerome made a mistake in translating the Hebrew Bible that would influence Christianity for many centuries. In a passage of the Book of Job (chapter 28, verse 16), Jerome translated a Hebrew expression meaning “the gold of Ophir” (a region in East Africa) as “the dyed colours of India”, referring to the brightly-coloured cotton cloth that India was already exporting throughout the world. Indian textiles were a highly valuable commodity in the ancient Mediterranean. Greek and Roman traders travelled to Indian ports like Arikamedu, near present-day Puducherry, to buy cloth, spices and other luxuries, in exchange for gold. It was only natural, therefore, that Roman subjects like Jerome associated India with rich colours and valuable dyestuffs. Yes, Jerome translated "Ophir" as "India" in Job 28:16. But since we don't know where Ophir was, it's not clear that this was a mistake. In his Anchor Bible commentary on Job, Marvin Pope lists "India, South Arabia, and East and South Africa" as possible locations. (See his comments on 22:24 on p. 168). Also, while we're on the subject of unicorns, this came up in my searches today: In pictures: Where to find unicorns in Scotland (Linda Howard, Glasgow Evening Times). You may already be aware of the fact that the unicorn is our national animal, but did you know this mythical creature was believed to be the natural enemy of the lion - a symbol of English royalty? Unicorns were written about by the ancient Persians, Romans, Greeks and ancient Jewish scholars. They all described a horse-like creature whose single horn had magical properties. Jerome followed the precedent set in Greek by the Septuagint and he too sometimes translated the Hebrew word for "wild ox" as "unicorn" (e.g., Psalm 21:22 = 22:21 English), but also often as "rhinoceros." The biblical translation as "unicorn" was also picked up in the King James Bible (e.g., again, Psalm 22:21). This ancient mistranslation set off an iconographic tradition that has lasted to the present (hence, Scotland) and a wild goose chase that lasted a long time. Past PaleoJudaica posts on Saint Jerome and his Latin Vulgate translation of the Bible are here and here and links. This book is a wide-ranging exploration of the heavenly double traditions in early Jewish pseudepigraphical accounts. The study treats the application of the heavenly twin imagery to human and otherworldly figures in its full historical and interpretive complexity through a broad variety of Jewish sources, from the patriarchical narratives of the Hebrew Bible to later Jewish mystical testimonies. This work argues for the Jewish origins of the heavenly counterpart motif by demonstrating its close connection with theophanic imagery manifested in the biblical accounts. The book demonstrates that the memories of almost all major biblical theophanies became crucial conceptual nexuses for unfolding the heavenly counterpart speculations in the Jewish pseudepigrapha. This study thus affirms a hypothesis that the complex symbolism of the heavenly double, found in early Jewish materials, takes its inspiration not from the Greco-Roman or the “Iranian” mythologies, as previously suggested by some scholars, but instead represents an authentic Jewish phenomenon deeply rooted in the theophanic traditions of the Hebrew Bible. This work also represents the first complete effort to show how some Jewish pseudepigraphical works, like 2 Enoch and the Ladder of Jacob, preserved solely in the Slavonic language, develop several unique traditions regarding heavenly counterparts. I've noted a recent book on the same topic, but dealing with a different ancient literary corpus, here and here. ANCIENT JEW REVIEW: The Multiple Faces and Phases of Texts at Qumran: Growth, Expansion, and Rewriting in Community Documents (Menahem Kister). What is an ancient text? How should similar but different texts be treated? When should a text be considered a “recension,” and when is it an independent text? How do such closely-related texts clarify each other? These general questions concerning the transmission of texts and traditions are relevant, sometimes crucial, for the study of the Hebrew Bible, the New Testament, and rabbinic literature. The answers are complex and elusive. The growth of texts is one of the most important phenomena for understanding the form in which they reached us. The texts found at Qumran help clarify various aspects of the growth of many ancient religious writings, because they represent a variety of texts from a period (ca. 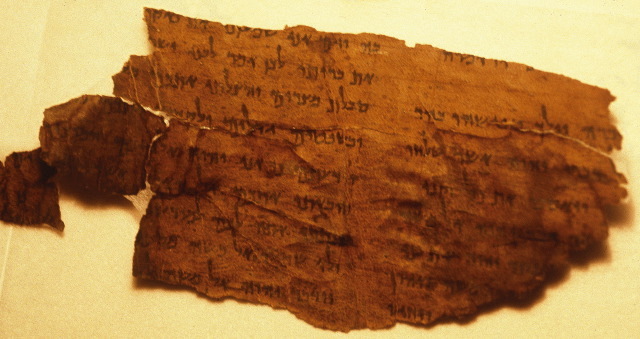 second century BCE–first century CE) from which previously no texts written in Hebrew had been preserved (with the exception of Ben Sira and the Damascus Document, see below). Earlier essays in AJR's current series on the Dead Sea Scrolls (in honor of the 70th anniversary of their discovery) are noted here and links. ARCHAEOLOGY: Ancient Roman House and Phallic Amulets Discovered in Israel (Owen Jarus, Live Science). A house dating back around 1,900 years, which is decorated with frescoes showing scenes of nature, has been discovered at the archaeological site of Omrit in northern Israel. Phallic amulets were also found at the site. The house was constructed during the late first or early second century A.D., and was likely two stories tall, said Daniel Schowalter, a professor at Carthage College in Wisconsin. "The floor [of the house] was plastered and its walls were covered in frescoes," Schowalter told an audience in Toronto at the joint annual meeting of the Archaeological Institute of America and the Society for Classical Studies in January. Well, that's different. I've heard of phallic statues before, but not phallic amulets. I suppose someone had to think of them. COMING IN MAY 2017: Vatican and Rome Jewish community host menorah exhibition (Reuters, rpt. YNetNews). The exhibition will be held in St. Peter's Square and the Rome synagogue complex and will include about 130 menorahs or depictions of them in paintings, ancient gravestones and sculptures, as well as medieval and Renaissance illustrations and manuscripts. Spoiler: the Vatican does not have the golden menorah that Titus plundered from the Temple, so it won't be on display. But there will be many other ancient etc. menorahs and depictions of menorahs, including the Magdala Stone. For the lost Temple menorah, which is pictured on the Arch of Titus, start here and follow the links. And also follow the relevant links in the same post for many other PaleoJudaica posts on ancient menorahs and depictions of them. Past posts on why the Temple menorah is not in the Vatican are collected here. DATABASE: Elyonim veTachtonim. Electronic inventory of angels, demons and ghosts in the early rabbinic literature. The current version covers the Babylonian Talmud. "Elyonim veTachtonim" means "the most high ones and the lower ones," with implied reference to the denizens of the heavenly realm and the realm of the underworld. The seventh-century CE Hebrew work Sefer Zerubbabel (Book of Zerubbabel), composed during the period of conflict between Persia and the Byzantine Empire for control over Palestine, is the first full-fledged messianic narrative in Jewish literature. Martha Himmelfarb offers a comprehensive analysis of this rich but understudied text, illuminating its distinctive literary features and the complex milieu from which it arose. Sefer Zerubbabel presents itself as an angelic revelation of the end of times to Zerubbabel, a biblical leader of the sixth century BCE, and relates a tale of two messiahs who, as Himmelfarb shows, play a major role in later Jewish narratives. The first messiah, a descendant of Joseph, dies in battle at the hands of Armilos, the son of Satan who embodies the Byzantine Empire. He is followed by a messiah descended from David modeled on the suffering servant of Isaiah, who brings him back to life and triumphs over Armilos. The mother of the Davidic messiah also figures in the work as a warrior. Himmelfarb places Sefer Zerubbabel in the dual context of earlier Jewish eschatology and Byzantine Christianity. The role of the messiah’s mother, for example, reflects the Byzantine notion of the Virgin Mary as the protector of Constantinople. On the other hand, Sefer Zerubbabel shares traditions about the messiahs with rabbinic literature. But while the rabbis are ambivalent about these traditions, Sefer Zerubbabel embraces them with enthusiasm. Sefer Zerubbabel was translated into English by John C. Reeves in Old Testament Pseudepigrapha: More Noncanonical Scriptures, volume 1 (ed. Bauckham, Davila, and Panayotov; Eerdmans, 2013), pp. 448-466. Edited by Koert van Bekkum, Kampen Theological University, Jaap Dekker, Apeldoorn Theological University, Henk van de Kamp, minister of Apeldoorn Reformed Church (liberated), Eric Peels, Apeldoorn Theological University. Since ancient times Leviathan and other monsters from the biblical world symbolize the life-threatening powers in nature and history. They represent the dark aspects of human nature and political entities and reveal the supernatural dimensions of evil. Ancient texts and pictures regarding these monsters reflect an environment of polytheism and religious pluralism. Remarkably, however, the biblical writings and post-biblical traditions use these venerated symbols in portraying God as being sovereign over the entire universe, a theme that is also prominent in the reception of these texts in subsequent contexts. This volume explores this tension and elucidates the theological and cultural meaning of ‘Leviathan’ by studying its ancient Near Eastern background and its attestation in biblical texts, early and rabbinic Judaism, Christian theology, Early Modern art, and film. Goring bull or goring ox? The word שור in Hebrew can refer to an ox or a bull, but which animal is the protagonist of the celebrated law of שור נגח, “the goring bovine”? The word itself is ambiguous. So is the context. APPREHENDED: Border officials thwart attempt to smuggle dozens of ancient coins into Israel. Coins span period of 1,400 years from the first century B.C. to the Mamluk period in the 13th century A.D. (i24 News). Israeli customs officials announced on Sunday that they had foiled an attempt smuggle dozens of ancient coins into Israel through the Allenby border crossing on the Jordan-West Bank border. Deputy Head Archaeological Officer Benny Har-Even said that the discovery prevented the "theft of history." "During the discovery we seized 53 ancient coins representing a cross section of 1,400 years of regional history, from the Early Roman period from the first century B.C. to the Mamluk period in the 13th century A.D.," Har-Even said. Narratives of soul flights are common in ancient Mediterranean literature, sharing many similarities such as the movement of the soul along a vertical path that is associated with life and death. But they also display significant differences such as peculiar accounts of cosmic realms, idiosyncratic reasons for soul flights, and wild diversity of associated rituals. Historical critical studies of soul flights have been unable to address successfully this problem of comparison, which remains unable to explain structures that are engineered consistently in cultural productions. Cognitive explanations are more helpful in this regard. Yet current cognitive explanations struggle to account for the differences. How can both the similarities and the differences be accounted for within the same parameters of the operations of human cognition? This paper presents a model called cognitive ratcheting to address this problem. It is a theoretical formulation of the natural mental process through which concepts take shape and are innovated when they are mentally mapped onto spatial orientations, then ratcheted up with intuitive cognition, and finally elaborated into many cultural variations by reflective thought. This process acknowledges that, at the same time a concept is diversified through reflective elaboration and ratcheted up within different cultural contexts, it retains deep structures, especially with regard to spatial orientations, intuitive processes, and reflective recursion. A groundbreaking work, this book brings together philosophy of science and language, conceptual dynamics and the Babylonian Talmud. The work asks: what philosophy of natural language lies at the basis of the Halakhic dynamic in the Amoraic discourse of the Talmud? Calling upon two post-Wittgenstein philosophies, the book undertakes a search for a philosophical account of the discursive culture that appears in the Talmud. It unearths the normative infrastructure that lies at its core. Thus, this study articulates what can be termed the Talmudic philosophy of language. On the other hand, it reveals the limits and weaknesses of central philosophical frameworks in coping with a profound traditional discourse like the Talmud, in which the past has a deep and integral role in the present, while at the same time, the present has its own natural and creative dynamic. PROF. LAWRENCE H. SCHIFFMAN: EXCITEMENT AS ADDITIONAL QUMRAN CAVE IS DISCOVERED. THE FASCINATING SAGA OF THE DEAD SEA SCROLLS CONTINUES. A reprint of his article in Ami Magazine. Background on "Qumran Cave 12" is here. It is possible that the cave once contained Dead Sea Scrolls, but some skepticism seems to be warranted. READING ACTS: Psalms of Solomon and the Hasmoneans. The writers of the Psalms of Solomon do not see the descendants of the Hasmoneans as the fulfillment of the prophetic hope for a good, righteous shepherd king in the tradition of David. Their protest is against the current regime (whatever the date) is in the tradition of prophetic condemnations of Manasseh in the Hebrew Bible. BAYLOR UNIVERSITY: Penn State Professor To Present “The Myth of the Dead Sea Scrolls” Lecture (Kelsey Dehnel). WACO, Texas (Feb. 17, 2017) – Daniel Falk, Ph.D., professor of classics and ancient Mediterranean studies and the Chaiken Family Chair in Jewish Studies at Penn State University, will lecture on Tuesday, Feb. 21 at Baylor University. The lecture, hosted by the Institute for Studies of Religion (ISR), entitled “The Myth of the Dead Sea Scrolls,” will start with reviewing popular conceptions of the Dead Sea Scrolls and move to consider what was important to the communities who wrote and cherished these scrolls. If you're in the area, don't miss it.